In just its second year, Race to the Stones is a scenic 100km footrace across the oldest pathway in Britain. Heres my experience of the event. I’ve never raced a marathon before, nor even a half-marathon. But when my workplace offered entries to take part in a 100km race, I leapt at the opportunity! I signed up online with a few mates from work who were keen for a walking challenge. I even convinced my girlfriend Zoey to take part, who as an ex-high jumper states she rarely exercises more than 8 steps! There are many different ways you can cover the distance, with some runners and walkers completing the full 100km nonstop! As my first time covering this distance, we opted in for the 2 day walking challenge which involved 48km on day 1, an overnight nap in a tent at Compton, to then complete the remaining 52km walk bright and early! Our places were kindly given to us by Get Connected, the official event charity for Race to the Stones. Based in the UK, Get Connected operates a free to call number which allows young people up to the age of 25 to discuss problems confidentially. Violence, money advice and mental health are just some of the areas where GC provide support to those who need it most. Travelling from the Midlands meant an early wakeup to get down for the race. Setting off at 3.30 in the morning to catch a team bus from Wednesbury was just the beginning of our two day adventure. Heavy rain was falling, lightning illuminated the dark sky repeatedly. The bed I had crawled out of seemed much more appealing to a 100km walk in the rain. What on earth had we signed up for? Luckily by the time we arrived in Chinnor, the weather had settled and there was only a little drizzle of rain. The registration tent was a convenient place to keep dry whilst the rain eased off. We received a race number, foot timing chip, and a handy info booklet which included a map, a guide to the route and even a chec of the creatures you may see whilst trailing (even grass snakes were there). Representing Get Connected also meant I was given a bright yellow t-shirt and a Nokia battery to plug into my smartphone when it starts to run low. One of the great things about doing this race, is that you don’t have to carry your overnight equipment with you. All our camping gear, drinks and snacks for day 2 were thrown onto a lorry ready to be reunited with at the halfway stage in Compton this evening. After a quick sausage sandwich for breakfast (that’s sports nutrition out the window) we met up with Jen, Mark, Carly and James from work as well as Sarah and Stephen. We all joked about how underprepared we were for this monstrous endurance event and came to the conclusion we were all a bit mad for taking part. The lead runners kicked off the race at 8am, with walkers following at 8.15. With approx 1500 entrants in the field, we took our time setting off for the long road ahead. Smiles at the start of the race. Walking along as a group we spent the first 6 miles walking over flat but pretty slippery ground. Within half an hour, we played the supermarket game, where each person takes a turn to recall a shopping list of items in alphabetical order to then add their own creative contribution to the list. Let’s just say there were a few items, I would be rather embarrassed to purchase for myself! Just as we hit 52 letters we arrived at our first pit stop. The 100km route is broken up by 9 pitstops which are ideal for refilling bottles, assessing the damage to your feet, and paying a quick visit to a portaloo. After the first 6 miles, all that slipping around in the mud in my running trainers meant I could feel a slight irritation at the back of my shoe; time to use my first Compeed blister plaster. Each pit stop offers a variety of fruit and snacks too, meaning you can fuel up before the next leg, or just grab and save for later if you want to crack on with the event. After a gentle 10k opener, it felt like playtime was over. Throughout stage 2, I counted three big climbs, across fields and woodlands, this leg definitely turned things up a notch. Those bright yellow shirts we were given were a hit with the local bugs! A quick change was in order. 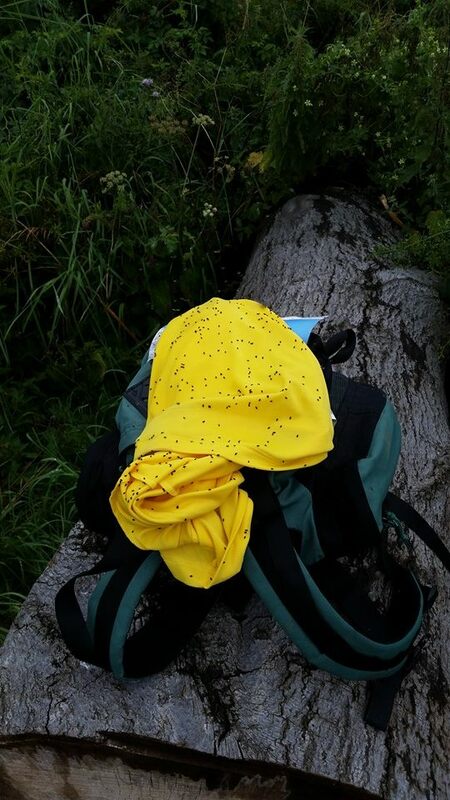 Top tip – When walking through a field of bugs, don’t wear yellow….. they love it! What was pretty cool about this stage were the two poppy fields we had to walk through. Here’s a group selfie in one of them. Towards the end of this stage, Zoey’s knee started to ache, so at the next stop we took the time to get it bandaged up to see if it would improve the situation. The second pit stop in a church included a free lunch, which after 12 miles is greatly appreciated! 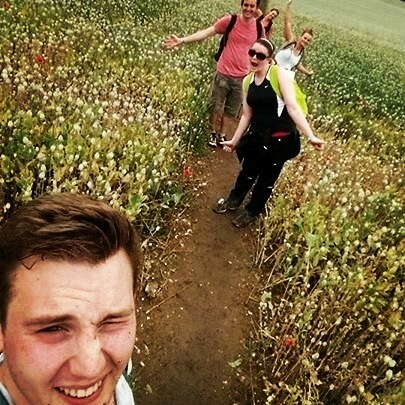 Quick selfie in the poppy fields. By this stage, the sun was shining and the Ridgeway was much dryer than earlier stages. Part three involved a trek along Grim’s Ditch; with the Anglo-Saxon definition translating to Devil. Though I felt great, Zoey must have been going through hell as the strapping on her knee wasn’t helping and she was starting to limp. Not to slow the group down, we let them go off ahead and took our time to pit stop 3. With an event support number on the race bib, we gave them a ring to see if we could get Zoey to the overnight camping by night. They were very understanding and said if Zoey waited for the station to close, they would have a minibus to pick up anyone who had to pull out. Such is the task of a marathon or ultra marathon, that if you feel niggles on the day it’s often not recommended to push on. Zoey told me I needed to carry on in order to raise money for Get Connected, so I carried on past pit stop 3, but decided to run bits of it. As the shortest leg of the course, I decided it was a good idea to get in a few miles of running to mix things up a bit. Overall this stage was less in the countryside, and passed over the Thames at Streatley which was very picturesque. Covering the 4.5 miles in close to 35 minutes, I managed to make up some good time. It may have been the final stage for the day, but there was no sympathy for all those km before hand. The stage begins at the foot of a hill which would have used too much energy to run up. There was still a great distance to cover in the weekend, and I had no idea how I would feel the next day. With this in mind, I decided it was best to complete stage 5 mostly walking, with a little bit of running on the easier stretches. I spent the first uphill refuelling on energy bars and crisps (I thought the salt would help). Around 45km, the race splits up into two for those who are doing the 100km in one go, and those who are heading towards Compton for a tent. Feeling tight and tired, I was glad I picked the latter. Those hills had took it out of me! Luckily, the road to Compton was a huge downhill. By the time I arrived in Compton, the sun was shining and there was a nice atmosphere with music pumping out the speakers and beers available for those who needed some stronger refreshment than water! I picked up my camping bag and placed all my gear in a pre-made tent that was waiting for me. Zoey had kindly booked in a much needed sports massage for me which really helped to loosen of the aching hip and a bit of calf cramp. Booking in advance was a huge plus as by the evening there was a back log of tired athletes who needed attention, and some of my friends who arrived later couldn’t get appointments due to full bookings. Something to take on board if you plan to compete at the Race to the Stones 2015. There was a free hot meal, in the school canteen, which tasted amazing after a tough days walking. How were the feet? looking good considering the distance. The Compeed I placed on earlier was protecting the heel on my right foot effectively. They did look a little more vainy than usual. 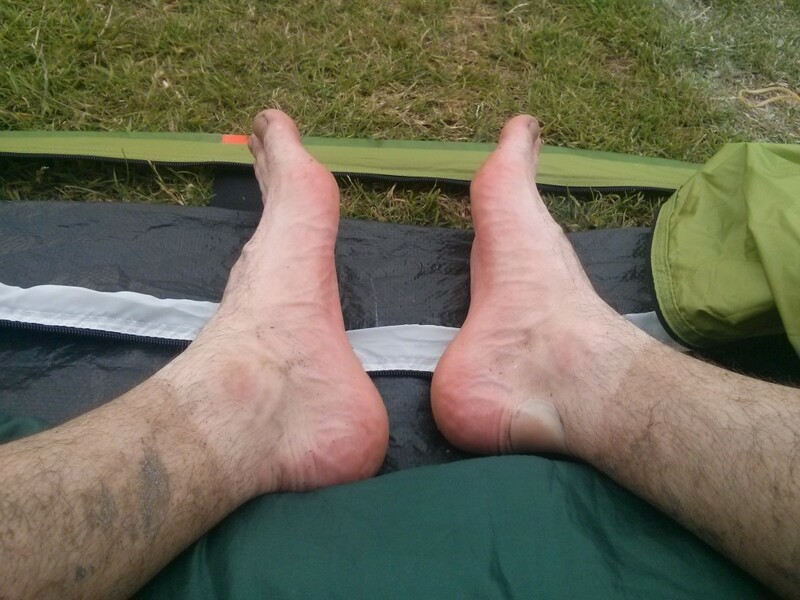 The state of my feet after day 1. Luckily no serious blisters, though very red and veiny. Waking up at 5am, I headed straight to breakfast as this is where the wall sockets for phone chargers could be found. My battery ran out yesterday, so wanted to get as much charge as possible to track the walk on my phone. Fry ups and continentals were available for breakfast, so got plenty of energy before the 52km ahead. The hips were pretty tight after yesterday, but having packed a foam roller in the bag, I managed to loosen this off before getting a 7am bus back to the Ridgeway. A morning mist floated on top as I passed through the timing gate. This was the longest stage of the whole event. After taking 2 miles to loosen off the legs walking, I started to mix up the pace with intermittent jogging. Overall things went ok, and by 60km I was feeling ready for the big distance ahead. 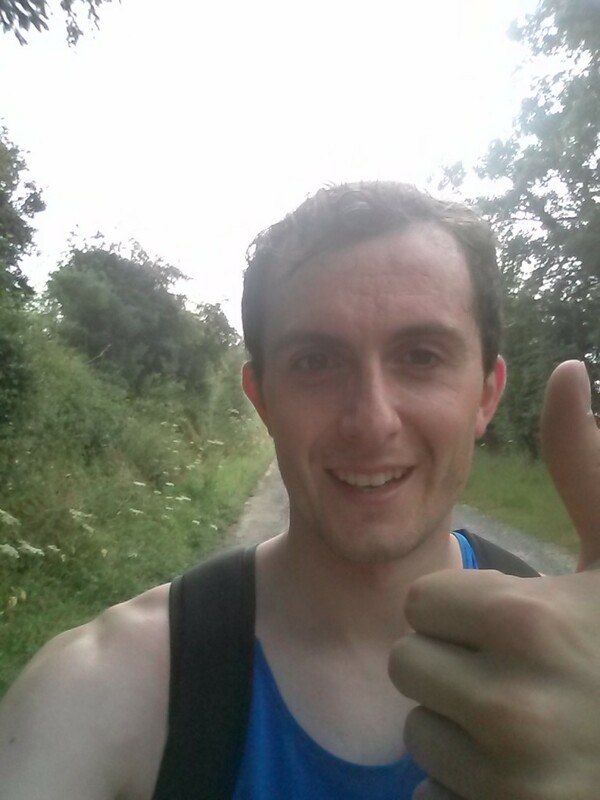 Thumbs up, as I passed around the 60km mark of my first ultramarathon. I found this stage quite tough on the legs, the downhill pathways were quite cracked and more curved like a pipe. It meant my feet weren’t planting as well as previous stages, and extra care had to be taken to avoid twisting an ankle. Didn’t feel great at the start of this stage. Despite layers of suncream, my neck was getting pretty burnt and my hip flexor was tightening up. I took my time on this stage, walking with a Red Bull for a caffeine boost and treating the hip with a small Ibuprofen. With time I was back in my stride and able to jog again. I must have jogged quite a bit as I entirely missed the sights of the Uffington White Horse. Another short one, starting with a massive downhill. With that caffeine high inside of me, I felt pretty invincible and decided to run the majority of this stage. There’s a huge downhill at the start. In my head, I was just counting down the miles, knowing 10-12 miles away from the finish was no different to a long sunday training run. After the downhill, this leg was pretty flat for the majority, travelling down really narrow pathways. It was super steep towards the end, but by this pitstop I knew I was close to the finish. The last 10km takes you right through the remains of Barbury Castle. I couldn’t see any ruins, but the outskirts of the site was huge at over four hectares! With 3km to go, it is possible to see the finish, but do not be fooled! You have to run around the Avebury stones first. This is the whole reason its called Race to the Stones! It was such a relief to see these as I knew I had nearly completed the distance. The last 400m is a downhill stretch where the finish feels like a mirage. You eventually reach it to be greeted by enthusiastic organisers and plenty of clapping. 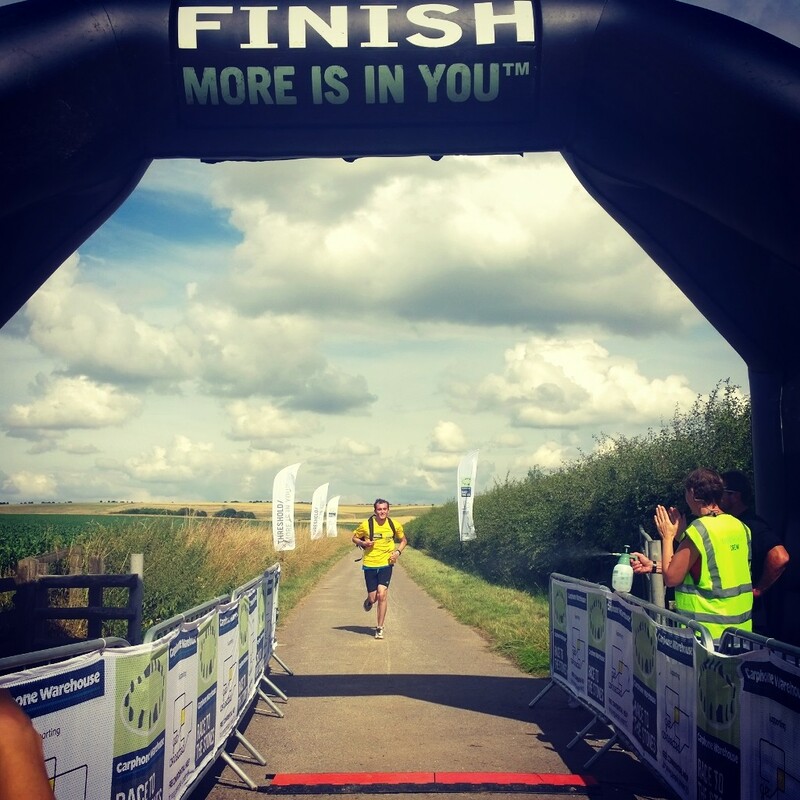 The finish – After 100km on foot, it was a sight I was very glad to see! For a event this long, a portable phone battery is a must. These are small cylinders with a microUSB port on to charge up your phone. Either that or ditch your smartphone for an old Nokia with a week long battery life. Plan your transport well! Being an ultramarathon, there was some serious distance between the start and finish and if you aren’t right on the day, it’s a daft idea to finish. We were lucky that the organisers had agreed to drive those who DNF’d on day 1 to the finish line. Being in the middle of nowhere, the same journey in a taxi fare would have cost about £80. So if you know you can’t finish, make sure you let the organisers know and group with other non finishers to get back onto normal transport. I need a better rucksack! Having intended to walk the distance, my work bag would have been fine. Once I started running, I often had to hold it to keep it in position. I might invest in a Camelback which I saw many of the runners using. 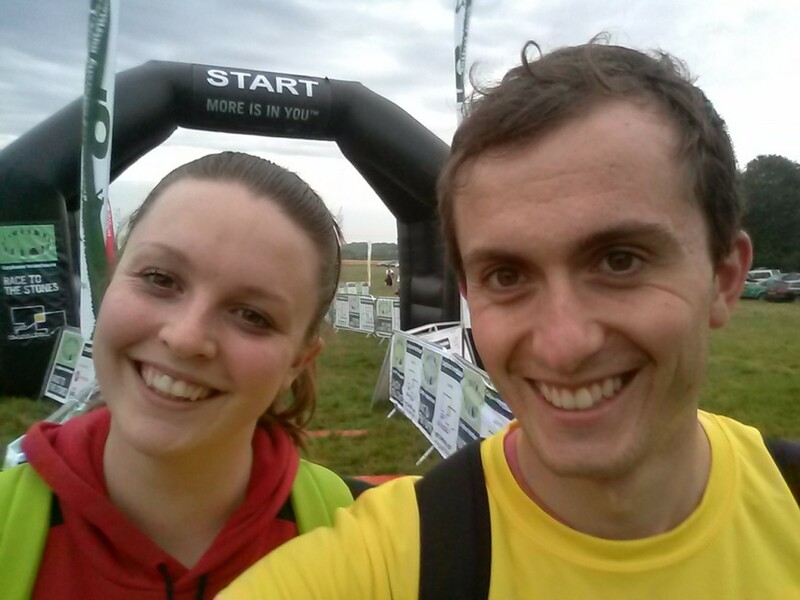 Would I do an Ultramarathon again? Definitely, I really enjoyed the event and this area of the country has some real beauty spots. I think next year I’ll try to run both days throughout and see how I perform. Need to up my training though if I want to take on this distance non-stop. The event does count as a qualification towards the Ultra Trail Du Mont Blanc (2 points) so if I ever want to pursue this, I know where to race domestically.